Do you dream of hardware keyboards, but still want the size and beauty of a Quad HD display. 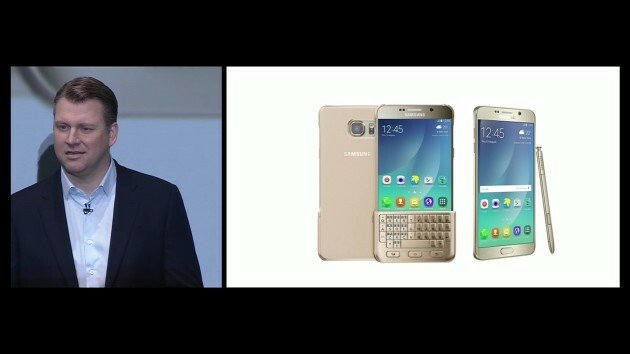 Samsung wants to make your dream come true with its new accessory, which attaches a full QWERTY keyboard to the company’s freshly announced Galaxy Note 5 and Galaxy S6 Edge Plus. Yep, that crazy picture we saw the other day wasn’t a joke. Your gut reaction may be to cringe at the sheer audacity of Samsung to attach a hardware keyboard to such beautiful devices. But there’s still a very big community out there who want the tactile feedback of physical buttons, and Samsung’s newest accessory will provide exactly that. Unlike Ryan Seacrest’s failed Typo accessory for the iPhone, this might actually be something a lot of people use. What particularly neat about the company’s new accessory is that the keyboard can be attached and detached on the fly; put it on the front when you want to bang out a lengthy email, and attach it to the back when you to view the device’s entire 5.7-inch display. It’s that easy. When the keyboard is attached, Samsung’s devices will recognize the accessory and adjust the UI accordingly, essentially shrinking everything to half of the display. And, get this: no Bluetooth connection is required. Instead, keypresses are sensed by the screen underneath, ensuring for a accurate and fast experience (one that won’t require any batteries). It’s nothing if not different. We got a quick hands-on demo of the accessory before today’s event, and it was just OK. It felt as cheap as it looks, and actually typing was a bit difficult. That may be because we’ve been conditioned to type on flat touchscreens, in which case, why does this thing exist? If you’re a die-hard hardware keyboard aficionado, this will be right up your alley. If not, well, move along.